About a month ago, I finally got around to making a formal altar for my practice. I had been just keeping my ritual items sort of scattered throughout my library, but this made things a bit difficult on mornings when I did my lunar rituals. 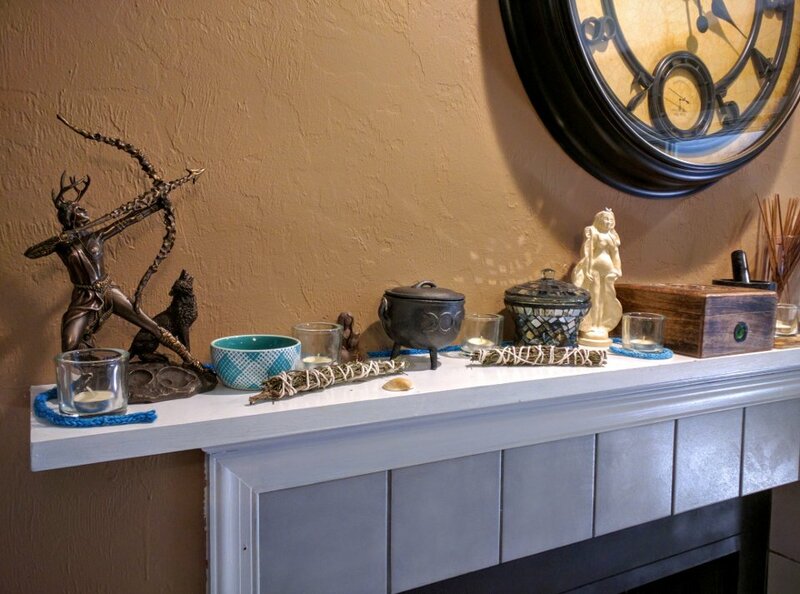 Collecting everything and then bringing it outside was taking far more time than it should, so I asked my wife if she was okay with me using the mantel above our fireplace as an altar. She had no objections, and I got started. (Surrounding everything) The handfasting cord that my wife and I knit together for our wedding. (Scattered around in important places) White tea light candles. A statue of Artemis standing on the lunar surface. A bowl for small offerings that I use for holding water during my rituals. Rosemary bundles from my garden. A sea shell from an important visit to the Atlantic Ocean. A tiny statue of Athena with an even more tiny owl (complete with an owl feather). My cauldron with a goddess symbol (comprised of a representation of the waxing moon, the full moon, and the waning moon). A statue of a woman with a broom that I use as a representation for Hecate. A wooden box that holds my extra candles and incense charcoal. A mortar and pestle given to me by a friend during the winter holidays. I use this to grind up herbs into a powder that I can burn with incense charcoal. A vase holding my stick incense. A wooden stick incense holder. You might be wondering exactly what I do with an altar. I try to start most mornings by briefly standing in front of the altar and thinking of things I'm grateful for. When I feel stressed out, I will often pause to light a candle and exhale out as much tension as I can. Sometimes, when I feel disconnected and out of sorts, I will stand in front of the altar for a few moments and remember that I'm part of natural cycles that have been ongoing for millions and millions of years. When I want to offer something back to the Earth, I'll usually put it on my altar in the little bowl until twilight or daybreak comes. Having an altar has been a great way to make my practice into a regular part of my life. Everything is just there waiting for me when I need or want it. This is especially important because I'm not the sort of person who allows herself to be governed by schedules or calendars. Other than my twice monthly lunar rituals, I practice when I feel motivated to practice in whatever ways inspire me in that moment. Having a space that is always set up with my tools makes it easier for me to be spontaneous.